Vladimir Putin: Anti-Russian Protesters in the Ukraine Are "Gay Nazis"
The gay Nazis label was simultaneously an attempt to tie the new pro-Europe camp in Kiev to the hated German Third Reich while also taking advantage of the growing acceptance of gay marriage in the West, particularly in the United States. “Putin has said homosexuality is not our values, and that sense of tolerance of homosexuality is not part of Euroasia,” said Schmidt, who will be in Ukraine monitoring the May 25 elections that are being overseen by the Organization for Security and Cooperation in Europe (OSCE). Euroasia is the name for the empire Schmidt believes Putin is trying to construct. Schmidt says Putin is driven by the goal of rebuilding a Euroasian empire with Moscow as its capital. Putin also has written extensively on the subject of Euroasia, which would generally follow the geography of the former Soviet Union. Bringing Ukraine into Moscow’s camp would be crucial to seeing that dream come to reality. Russian media also have called the Maidan square, where protests led to the demise of former pro-Russian Ukraine President Viktor Yanukovych, the “Gayeuromaidan,” thus tying together Europe and the gay rights movement, writes Yale history professor and author Timothy Snyder in The New York Review of Books. Pretty rich coming from a murderous dictator who has Neo Nazi gangs roaming the country and beating up foreigners and gays for him. 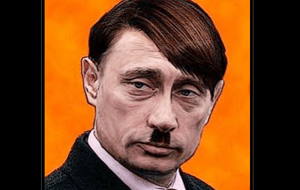 Tying in gays with unwanted foreign influence much like Hilter did with the Jews – just another in the “coincidences” between Putin and Hitler. Russia’s acquisitions, interfering, blaming of an already-disliked minority, and hosting the Olympics are seeing it moving along the same path to war.